ELECTRONICS GURUKULAM: What is Clock Skew and Jitter? Consider the drawing above. The green trace (and equation) represents the ideal case (a pure sine tone at the exact frequency desired with zero crossings at the exact locations desired, therefore sigma = 0). The blue trace represents an exact replica of the green trace, except that the zero crossings are delayed with respect to the green trace (therefore phi = a constant). The blue trace is said to have skew (i.e. a fixed delay) with respect to the green trace. Now consider the red trace. It too has a skew component relative to the green trace; but not to the same degree as the blue trace. However, the points at which the red trace crosses the x-axis vary with time. The value of phi is a function that contains both a constant (which explains the fixed skew) and a random function, usually noise that is associated with gaussian processes or even deterministic noise sources. The green trace is the most desirable since it is exactly what our system needs in terms of frequency, delay, and noise. The least desirable trace is the red trace. Why wouldn't the blue trace be least desirable? Because a fixed delay (skew) is usually correctable using software, board layout techniques, etc However, removing the noise on the red trace is considerably more complicated. The characteristic of the periodicity of a signal varying with time in a random, undesirable fashion is called Jitter. Deterministic jitter exhibits behavior that is predictable and repeatable; therefore it can be quantified accurately with a relatively low number of observations. For this reason, deterministic jitter can be expressed as a peak to peak value (a typical value might be 5 ps pk-pk). On the other hand, random jitter is the result of uncorrelated stochastic processes which makes it much less straightforward to measure or quantify. 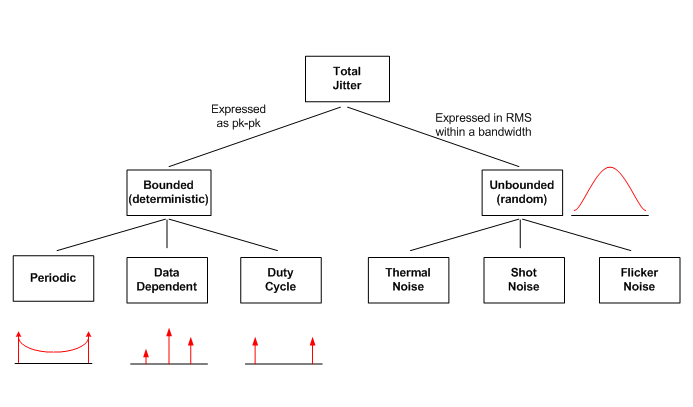 Random jitter is expressed as an RMS value and requires that a measurement bandwidth be appended to it as a qualifier. A typical value for random jitter might be 1 ps RMS (12 kHz - 20 MHz). Is it same for digital clocks also.How skew and jitter defined for digital clocks. Thank you very much for posting and sharing this great Blog And Good Information.carry on your posting.